Having just watched ‘Last Days in Marienbad’ in the cinema and talked about ths films influence on Stanley Kubrick and ‘The Shinning’, it very timely that this documentary has appeared on dvd. 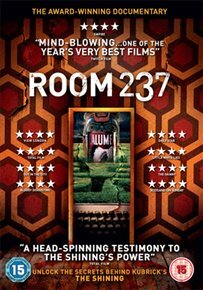 Room 237 examines the numerous theories that have arisen over the years about the hidden meanings within Stanley Kubrick’s 1980 horror film ‘The Shining’. With a reputation for being a playful puzzle-maker as well as a notorious perfectionist, Kubrick was known for attending closely to every detail in his films, providing a field day for analysts to search for all manner of hidden codes, clues, subtexts and messages within the minutiae of his films.